John Ford's motion picture, Stagecoach, his classic 1939 cinematic parable of the Old West, virtually defined the image we carry in our mind's eye of nineteenth century stagecoach transportation in the Southwest. This includes John Butterfield's Overland Mail Company stagecoach service, which connected St. Louis, Missouri, and Memphis, Tennessee, with San Francisco, California. Ford’s six passengers, plus the conductor and driver, traveled through the Southwestern deserts in a finely crafted Concord coach, drawn by three pairs of beautiful horses over a spectacular route through Monument Valley. The passengers rode three abreast within the coach, in facing, padded leather seats. They had ample room for their legs and an exterior boot for their baggage and the mail. They stopped for unhurried meals and rest at way stations. They suffered only briefly from dust and snow storms. They fretted about Geronimo’s marauding Apaches. Ford gave us unforgettable cinema, but entirely forgettable history. 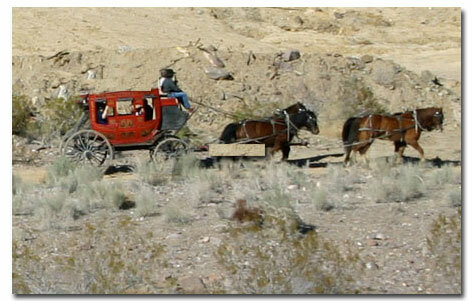 Butterfield’s passengers, not six but usually nine, plus conductor and driver, crossed the Southwestern deserts, not in a fine Concord, but in the much lighter, bone-jarring Celerity (a synonym for "quickness") coach, drawn, not by three pairs of beautiful horses, but usually by two pairs of raw-boned mules. They traveled, not through Monument Valley, in southeastern Utah, but through the Chihuahuan Desert of western Texas and southern New Mexico, the Sonoran Desert of southern Arizona, and the Colorado Desert of southern California. The passengers rode three abreast, squeezed into back and middle rows, both facing forward, and into a forward row, facing rearward. The facing passengers in the forward and middle rows had to ride with their knees dovetailed. All the passengers rode with baggage on their laps and mail pouches beneath their feet. They travelled relentlessly, day and night, with no more than brief moments at way stations for often poor food and no rest. They suffered, not from brief dust and snow storms, but from continual heat and choking dust in the summer and intense cold and occasional snow in the winter. Like Ford’s passengers, Butterfield’s passengers worried about the Indians, although not about Geronimo, who appeared as an Apache leader, far south of Monument Valley, nearly two decades after Butterfield terminated his service across the Southwest. Butterfield’s route extended some two thousand eight hundred miles (the longest stage line in the world) with the middle of the trail, or some one thousand one hundred miles, crossing the Chihuahuan, Sonoran and Colorado deserts. It entered the Chihuahuan Desert at Horsehead Crossing on Texas’ fabled Pecos River, and proceeded generally west across Texas, passing the Guadalupe Mountain en route to El Paso. The route turned north to New Mexico’s Mesilla Valley then west across the southern part of the state, passing beneath Cooke’s Peak. It entered Arizona near Stein’s Peak and the Sonoran Desert around Apache Pass, proceeding west through Tucson and Yuma. Finally, the line left the Sonoran Desert and turned northwest, into California’s Colorado Desert, headed for Las Angeles. A through passenger paid two hundred dollars (equivalent to about three thousand dollars today) for a ticket. He expected to arrive at his destination after some twenty five days of ceaseless travel. A modern passenger, by contrast, can buy an airline ticket for transportation from St. Louis to San Francisco for three hundred dollars, and can expect to make the journey in as little as four hours or so. William Tallack, an English cleric who traveled from San Francisco to St. Louis on the Butterfield line in the summer of 1860, said that a passenger awaiting departure worried about "how far he might be able to endure a continuous ride...with no other intermission than a stoppage of about forty minutes twice a day, and a walk, from time to time, over the more difficult ground...with only such repose at night as could be obtained whilst in a sitting posture and closely wedged in by fellow-travellers and tightly-filled mail-bags." "A third ground for apprehensive anticipation was the extreme liability of vehicles to overset [overturn] during a journey through regions possessing no macadamized roads, and often only a route the most rugged and steep. In case, too, of any accident or illness...there was the certainty of being placed in a very unpleasant position..."
"Arms are not furnished the passengers by the Company," the correspondent cautioned. "Were I to make the trip again," he said, "I would take...the stoutest suit of clothes I could get, with a strong, loose pair of boots..."
Butterfield’s passengers seldom found that a trip equaled their forebodings. "The fatigue of uninterrupted traveling by day and night in a crowded coach, and in the most uncomfortable positions, was beginning to tell seriously upon all the passengers, and was producing in me a condition bordering on insanity..."
Watterman L. Ormsby, a reporter for the New York Herald and the only through passenger on the Butterfield’s maiden westbound trip, in 1858, reported that a run up the east side of the Pecos River to a crossing passed over a trail "along the edge of the plain, thumping and bumping at a rate which threatened not to leave a whole bone in my body. What with the dust and the sun pouring directly on our heads...I found that day’s ride quite unpleasant..."
The English cleric Tallack, his coach stopped for a change of teams at a way station in southern Arizona, said that, "Today, on having a relay of mustangs, they reared up and plunged worse than usual, broke the pole-chain, stood up nearly perpendicularly, and, finally, one fell and got underneath the body of the waggon, which movement, together with the threatening kicks and jerks of the animal, caused our speedy evacuation of the vehicle..."
The New York Herald reporter, Ormsby, his coach ascending the rugged trail westward up to the pass at the south end of Texas’ Guadalupe Mountains, said, "We were obliged actually to beat our mules with rocks to make them go the remaining five miles to the [way] station, which is called the Pinery..." The correspondent, his coach approaching the Guadalupe Pass from the west on a cold November said, "...we were informed by the driver that we were near a lay of sand four miles in length, and that we must walk through if we expected ever to arrive at our next station...the Pinery... Scarcely had we commenced our tramp on foot, before the young moon was veiled in a fleecy mist, which came down upon us poor devils and continued to play away upon our dusty hats and blankets until we had plodded our weary way four miles through the deep and heavy sand..."
"Meals (at extra charge) are provided for the passengers twice a day," said Tallack. "The fare, though rough, is better than could be expected so far from civilized districts, and consists of bread, tea, and fried steaks of bacon, venison, antelope, or mule fleshthe latter tough enough." For breakfast at a way station in West Texas, Ormsby had "jerked beef (cooked on the [buffalo] ‘chips’), raw onions, crackers slightly wormy, and a bit of bacon." VOUCHSAFED BY ANYONE BUT GOD. Passengers and crew readied their weapons at the slightest sign of Indians, especially in the Mescalero Apache country of West Texas and the Chiricahua Apache regions in Southern New Mexico and Arizona. At way stations east of Tucson, the correspondent noted, "Rifles, shot-guns, revolvers and muskets, heavily charged, and at convenient places are the objects that first strike attention..."
The conductor and driver saw Apaches encamped beside the trail during a night passage through southern New Mexico and, "When their campfires were first seen, the conductor immediately awoke the passengers, and rifles and revolvers were drawn from their holsters ready for instant use..."
"At Gila Bend, Sutton’s ranch, we saw a dead Apache Indian, tied in a standing posture to a tree," said H. D. Barrows who traveled across southern Arizona en route to Missouri in late 1860. 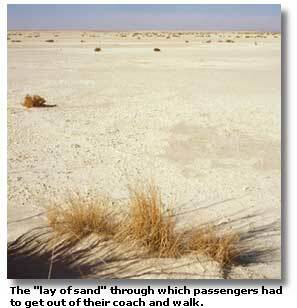 "He had been shot by Sutton’s son, a lad of about fourteen..."
In spite of hardships and fears, Butterfield’s passengers sometimes found exhilaration in their adventure across the deserts of the Southwest. "The Apache Pass was a rugged but very picturesque portion of our route," said Tallack, "and will be long remembered by the writer as the scene of the finest storm and sunset he ever witnessed." 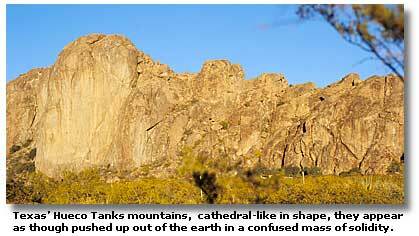 "The rocks at this station [Hueco Tanks, about thirty miles east of El Paso] are visible for a distance of twenty miles on the plain," said the correspondent. "When they are reached they present a most wild and imposing aspect. Cathedral-like in shape, they appear as though pushed up out of the earth in a confused mass of solidity..."
"...I shall never forget," said Ormsby of his passage by the Guadalupe Mountains, "the gorgeous appearance of the clouds: tinged by the setting sun above those jagged peaks, changing like a rapid panorama, they assumed all sorts of fantastic shapes, from frantic maidens with dishevelled hair to huge monsters of fierce demeanor, chasing one another through the realms of space." Butterfield’s employees, said Ormsby, "I found, without exception, to be courteous, civil, and attentive... I found the drivers on the whole line, with but few exceptions, experienced men. Several are a little reckless and too anxious to make fast time, but as a generally thing they are very cautious." At the end of his journey, Barrows reflected, "To many people, doubtless, who think more of their ease than they do of robust physical health, a stage ride of a thousand or two thousand miles, may seem a very formidable undertaking. But for those who had a liking for adventure, and a desire to see something of the world, a long ride of two or three weeks, practically in the open air, not in hot, stuffy cars, possesses a wonderful charm, especially in remembrance..."
Bishop, C. C. Frontier Stories of the Lone Star State. Self Published, 1936. Butterfield Overland Mail. Website, Internet. Conkling, R. P. and Conkling, M. B. The Butterfield Overland Mail, 1857-1869, Volume I. Glendale, California, The Arthur H. Clark Company, 1947. Giddings, E., Mahon, W. and Kielman, C. V. "George H. Giddings and The San Antonio-San Diego Mail Line." Southwestern Historical Quarterly, Volume LXI, July, 1957 to April 1958. pp 220-239. Greene, A. C. 900 Miles on the Butterfield Trail. Denton, Texas, University of North Texas Press, 1994. Hilton, W. H. Sketches in the Southwest and Mexico 1858-1877. Los Angeles, Dawson’s Book Shop, 1963. Hollon, W. E. The Southwest: Old and New. New York, Alfred A. Knopf, 1961. Kurtz, D. and Goran, W. D. Trails of the Guadalupes: A Hiker’s guide to the Trails of Guadalupe Mountains National Park. Champaign, Illinois, Environmental Associates, 1992. Lang, W. B. (Editor) The First Overland Mail, Butterfield Trail, St. Louis to San Francisco, 1858-1861. East Aurora, New York, Roycrofters, 1940. Farwell, J. M. "Correspondence to the Daily Alta California, 1858." pp 111-127. Lang, W. B. (Editor) The First Overland Mail, Butterfield Trail, St. Louis to Memphis, 1858-1861. East Aurora, New York, Roycrofters, 1945. Pumpelly, R. "A Journey by Stage-Coach to Arizona." pp 54-62. Barrows, H. D. "A Two Thousand Mile Stage Ride." pp 64-70. Ormsby, W. L., The Butterfield Overland Mail. San Marino, California, The Huntington Library, 1998. Richardson, R. N. "Some Details of the southern Overland Mail." Southwestern Historical Quarterly, Volume XXIX, July, 1925. pp 1-18. The Texas State Historical Association. Handbook of Texas Online. Joint Project of The General Libraries at the University of Texas at Austin and the Texas State Historical Association, 1997-1999. Website, Internet. Twain, M. Roughing It. Pleasantville, New York, Reader’s Digest Association, 1994. Williams, J. W. "The Butterfield Overland Mail Road Across Texas." Southwestern Historical Quarterly, Volume LXI, July, 1957. pp 1-19.